Flint & Flame Himalayan Salt Slabs are manufactured from crystal salt that has been deposited in the earth for more than 260 million years. The salt is traditionally mined, reaching depths of 700 – 1100 meters. These conditions provide a pure, natural product. The health benefits of Flint&Flame Himalayan Salt Slabs are essential for us because it helps balance the highly complex water and salt metabolism within our body. Himalayan salt restores the natural resonant frequency of the body and returns us to our true vibration which is the foundation of health, happiness and life itself. 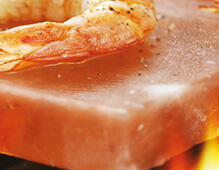 Delicious tasting and rich in minerals, Himalayan salt is among the purest forms of salt in the world. This crystal form of salt has been maturing over the past 250 million years under intense tectonic pressure, creating an environment of zero exposure to toxins and impurities. Free of bleaches, preservatives and chemical additives, it has more than 84 minerals and trace elements essential for good health, including 1.2% sulphur, .4% calcium, .35% potassium and .16% magnesium. This high quantity of trace minerals causes the salt to impart a milder, yet fuller salt taste to foods which adds a whole new level of delicious flavour to any dish! You can buy Himalayan salt slabs and blocks here now. For information on using and caring for your salt block click here. For more information you can call us on 01403 740 230, email info@flintandflame.co.uk or use the form on our Contact page.